Sorry about the lack of posts recently. I really got on a roll with my Starbucks Christmas mugs but then the Japan earthquake/tsunami/nuclear disaster occurred and my hands were full leaving the country, sorting myself out financially and then looking for a new job once I got back to my apartment in Tokyo. Long story short I’m fine, as are most people in Tokyo, so let’s get to my latest Starbucks Mug spotlight! Here in Tokyo, we’re in Hanami season (Cherry Blossom Viewing) so I felt a little inspired to feature my Japanese Starbucks Sakura mugs. As with New Years, Japan creates special exclusive mugs for the season every year and due to their limited supply they sell out fairly quickly. 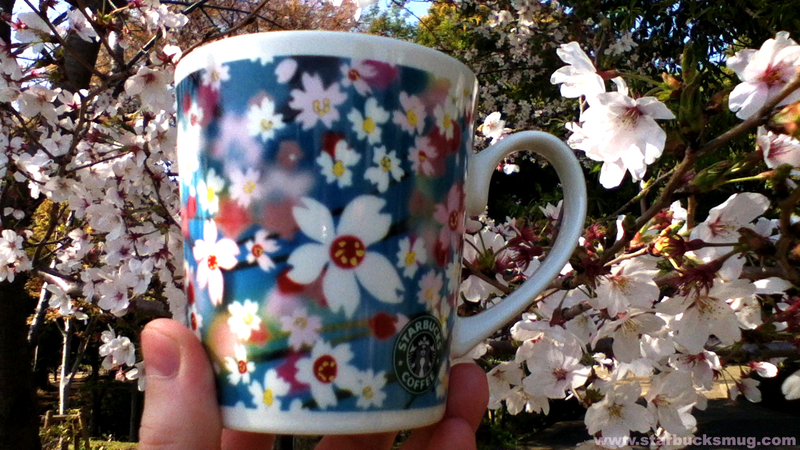 I bought this mug in 2007 at a Starbucks in Shibuya and took this photo and video last weekend in Numabukuro during the peak Hanami period. This was the first Sakura mug I had ever noticed in Japan though judging by a Google Image search the Japanese Sakura Mugs go back to at least 2005. I love these Sakura Mugs as they’re a really nice change from the regular Starbucks City Mugs and the fact that they’re exclusive to Japan makes them a very desirable and rare collectable.